What’s your favorite Blake Lively dress? Considering she’s an A-lister who’s constantly making red carpet appearances, it’s hard to decide. From the burgundy Gucci Premiere dress she wore for the opening of Cannes 2014 to her most recent Met Gala gown by Versace that was so big she had to take a party bus to the venue, she’s had some seriously iconic fashion moments. But if you’re anything like us, you’ll know the actress has a knack for putting outfits together like no other. So scroll down to find out how you can get Blake Lively style for yourself. When Blake Lively appeared on The Tonight Show Starring Jimmy Fallon last October, her Roland Mouret Felcourt dress became one of our favour Blake Lively dresses of all time. Sensibly, she swapped out her Christian Louboutin So Kate stilettos for the brand’s block heeled Aketi sandals for her dance battle with Jimmy. While the shoes are no longer available, the Christian Louboutin Suzanna pumps in the same Glitter Dragonfly colorway are. Date night for Blake means mixing new-season pieces with wardrobe classics. At a movie screening with her husband Ryan Reynolds, Blake styled a Monse sequined basketball jersey with side-snap pants from the label, red Douce Du Desert heels from Christian Louboutin and a trusty Chanel Boy Bag. 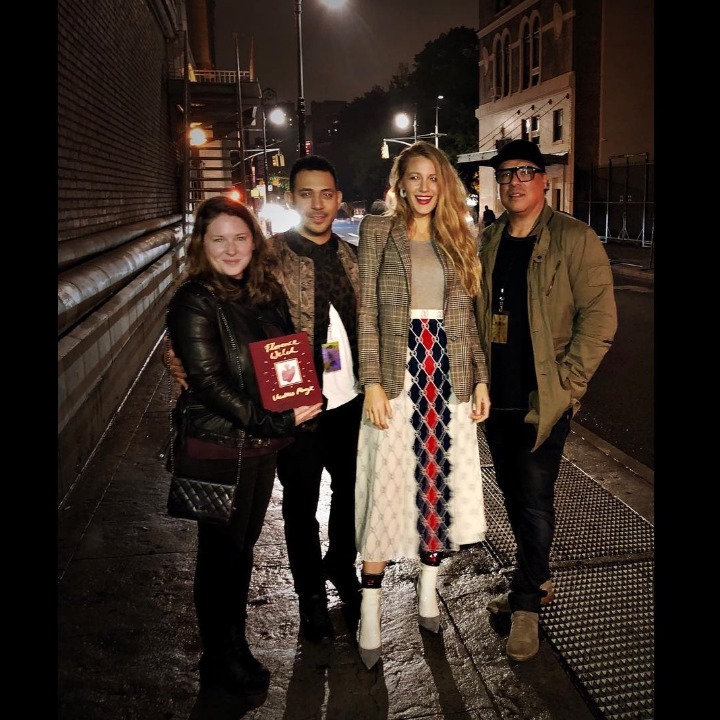 On the press tour for All I See Is You, Blake made us realize that we didn’t have a pink lemon-print midi skirt but we needed one ASAP. She teamed the Vika Gazinskaya piece with a simple white The Vee T-shirt from Rag & Bone, Finn Heart earrings and glittered Christian Louboutin pumps she borrowed from her sister Robyn. For a night out in January, Blake proved that leopard print is always a good idea with a pair of green flared pants from Brandon Maxwell. Paired with a draped-back sweater from the New York brand, a lipstick-shaped clutch bag from Judith Leiber and some oversized pink earrings, Blake proved yet again that her style is always on point. On a recent outing with friends to see Florence + The Machine, Blake wore a Gucci printed midi skirt with a plain beige top and a plaid blazer from Chloé. Thankfully, Blake-approved brand Monse has one just like it and her long-sleeved T-shirt is a perfect match from one of her other favorite brands, Rag & Bone. We also can’t get enough of her socks-and-shoes combo, which is easy to replicate with Manolo Blahnik BB pumps and Gucci socks.